SUMMARY: The examination of the charge of idolatry against the Saracens of George the Monk is divided into the discussion of the following points: (1) to trace some themes belonging to the classical literary tradition concerning Arabs and Saracens, still present in George the Monk; (2) to show the relationships among astrolatry, pre-Islamic deities and Islamic monotheism; (3) to show the change and the adaptation to the Greek language of some Arab terms; (4) to highlight the different characteristics of the charges of idolatry by John of Damascus and George the Monk to the Saracens; (5) to identify the Arabic deity hidden in the Greek name. SUMMARY: A chapter of the Gesta Tancredi in expeditione Hierosolymitana, written between 1112 and 1118 by Ralph of Caen, is devoted to the discovery and destruction of an idol of the Prophet Muh.ammad placed inside the Templum Domini in Jerusalem. This was the name given by the Crusaders to the Dome of the Rock, the shrine built by the Umayyad Caliph ‘Abd al- Malik ibn Marwa¯n (685-705/65-86) on the area once occupied by the Jewish Temple. The analysis of the text will infer that the statue described by Ralph, rather than a representation of the Prophet of Islam as the god of the Saracens, is that of the Antichrist, who was identified as Muh.ammad and located in the Dome of the Rock because of the eschatological meaning of the shrine. Indeed, it will be shown that some Crusader texts, until now overlooked in reference to this aspect, recognized the Dome of the Rock as the Temple of Solomon rebuilt by the Antichrist according to the events expected to occur in Jerusalem before the end of time. This tradition will be related to Christian and Jewish reactions to the Islamic conquest of Jerusalem in 637 and to the interpretation of the figure of ‘Umar ibn al-Khattab (r. 634-644/13-23). 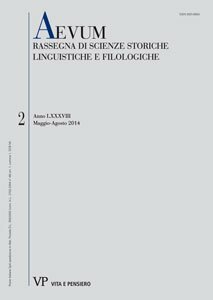 SUMMARY: The present study aims at tracing the historical evolution of the image of Longobardia and of the Longobards (as well as Lombardy and the Lombards) in the works of mediaeval Arab-Islamic geographers (9th-15th c.). Longobardia is represented in different ways, depending on periods, contexts and perspectives; sometimes it is identified with the Italian Peninsula of the Longobards, and sometimes with the Longibardia or Lagobardia of the Byzantines. It was not until the 12th century that a clear distinction was made, from an onomastic point of view also, between Lombardy (Anbard. iyah) and Longobardia (Ankubardah), with the latter understood exclusively in reference to the south, which derives from the geographical idea of the Byzantine thema of the same name. The Longobards, as a people, appear both in Langobardia Minor and in Langobardia Maior; the capital of the latter was Pavia, a city defined by its palace and a renowned equestrian statue: the Regisole. The Lombards too were undoubtedly present in the territory that extends from the Alps to the Po, well established in their main towns, in Pavia and Milan, but also in Monferrato and Ferrara. SUMMARY: The Passio Medici (BHL 5877) can be defined as a hagiographical cento, drafted using the Passio Naboris et Felicis (BHL 6029b) as the main literary source. Some passages of the text lead us to suppose that the author of the Passio Medici read his hagiographic model in the literary form as attested by the manuscript Vp = Citta` del Vaticano, Biblioteca Vaticana, Arch. S. Petr. A.4, ff. 227v-230r (11th cent.). SUMMARY: Horace’s Ars poetica was the only ancient poetics available to medieval interpreters and grammar teachers before Aristotle’s Poetics was translated into Latin (late 13th c.). Two scholia collections and ten full commentaries from the 11th and 12th centuries demonstrate the medieval focus on mimesis in a general poetics, on tone, authorial intent, genre requirements, and on stylistic variation of heroic, satirical, lyrical, and dramatic poetry, exemplified from Roman literature. Particularly character delineation is carefully handled and coordinated with stylistic considerations of dialogue, narrative order and plot - providing the new, medieval Poetriae by Matthew of Vendoˆme, John of Garland and Geoffrey of Vinsauf with both theoretical insights and practical advice. SUMMARY: The paper focuses on the edition and translation of some recipes for the production of inks and dyes, written in the Byzantine Age. Three of those can be read at f. 218v of ms. Milano, Ambr. C 222 inf. (1180-1186); the first one, with a lack of two lines and a half, shows precepts for a crocus dye; the second one describes the practice for getting lacha, and the third one allows us to get golden ink. Two other recipes, till now unpublished, have been translated with some remarks. They are at ff. 62v-63r of ms. Bologna, Biblioteca Universitaria, 1808 (15th cent.). Both recommend the use of two vegetable substances (sumach and varzin), which are not present in the Ambrosian recipe. SUMMARY: Fruttuaria Easter liturgy shows some discrepancies from those of Cluny and Saint- Be´nigne at Dijon. The liturgy, described in the two different textual forms of customs of Fruttuaria (LO and S), shows great difference in purpose, liturgical place, using of liturgical ornaments. In the S text a real Visitatio Sepulchri is described. This kind of rite was unknown at Cluny. The LO textual form, on the contrary, describes an Easter liturgy identical to the Cluniac one until the last station of the procession before the High Mass. This station was replaced in the LO text by a rite similar to the Visitatio Sepulchri and Quem quaeritis, but with a different purpose: The worship of a relic of the Holy Sepulchre preserved in the abbey. The rite actually performed at Fruttuaria was probably the last one. Therefore, the Sepulchrum found in the abbatial church of Fruttuaria by the archaeologists was not used during the Easter liturgy in order to perform a Visitatio Sepulchri, but in all probability it was a reliquary for the relic of the Holy Sepulchre preserved in the abbey. SUMMARY: The manuscript London, British Library, Additional 6891 (Y), not considered in the recent National Edition of Dante’s Monarchy, permits to emend the very controversial words sicut in Paradiso Comedie iam dixi (Mon. I XII 6), a supposed self-quotation of Par. V 19-24. As shown by variant readings of the segment (corrupt but emendable) and equally distinctive readings elsewhere in the text, Y stands high in the manuscript tradition and is a witness of such importance as to require a revision not only of the text, but also of the stemma codicum of Dante’s treatise. SUMMARY: This contribution offers the critical edition of a Latin eclogue composed in 1403 by the Veronese poetess Angela Nogarola, with an historical commentary. The text is transmitted only by the MS Trento, Bibl. Comunale, 4973. This eclogue is dedicated to Francesco Barbavara, the most important minister of Giangaleazzo Visconti, duke of Milan. The essay explains the allegories of this pastoral poem: Barbavara is symbolized by the sheperd Maecenas, in exile far from his fields; Giangaleazzo is represented as a high beech (altissima... fagus), the most beautiful tree in the forest, allegory of Milan. After Visconti’s death in september 1402, the dukedom was in trouble, and Barbavara was forced to escape from Milan because of an insurrection headed by Antonio Porro, symbolized by the sheperd Porreus.